A hungry hello everyone to this month’s live chat – the last one for the summer. I hope you’re hungry as it’s right around lunch, dinner always snack time. Today I’ll be discussing one of travel’s most delicious experiences – street food – with my guest and marshmallow enthusiast Jodi Ettenberg. Scroll down for the live chat recap happening for the next two hours! The chat is only open from 2pm-4pm US EST; (6pm-8pm GMT; 11pm-1am New Delhi) Next Live Chat coming this September! 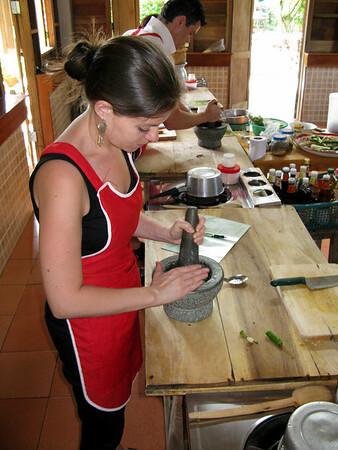 Jodi Ettenberg is a former lawyer who quit her job in early 2008 to travel (and eat) her way around the world. She chronicles her travels in words and photos on her site, Legal Nomads. I’ve known Jodi online since we were both budding bloggers and our traveling paths have crossed in Vancouver (during last year’s TBEX Conference) and later in 2012 in Istanbul. I’ve told her if I had to pick only one person to follow online it would be her Twitter feed – which I highly recommend you do as well. Aside from curating the best links on the web, Jodi knows food and we’re ready to discuss the street variety. Drop down into the comments to post your questions, comments, and secret places to eat along the street. Jodi will be chatting live from Canada and myself from Germany; we look forward to hearing from you wherever you are as well! Hello everyone and welcome to this month’s live chat! It’s the last one for the summer so we’re covering one of (if not THE) favorite part of traveling for me – street food 🙂 My guest this month is Jodi Ettenberg. The Modern Nomad gives us his theory of travel compression and appropriate for today’s talk Vicky introduces me to Uzbek plov. Thanks for having me on the live chat session, Anil! Looking forward to questions and talking food. I appreciate you taking the time 🙂 Where are you right now and what have you been up to over the last few weeks? In the eastern townships in Quebec at the moment, visiting family. I try to structure my travels so that I’m away in the colder months but get some family time in the summer. I’ve been writing the last few weeks – working on a book about food and travel, and I’m trying to get my first draft finished in the next week or so. Now I’m curious to hear more about it, anything you can share? Sure. I’ve yet to make a formal announcement as I’d like to get the draft done first but essentially it will be a handbook for travelers who want to see the world through food. In part, stories from chefs and food writers and my own travels about the rewards of connecting with people through the things they eat, but also a good part of the book will be allocated to tips for doing so safely. People write me often asking how to eat street food without getting sick, so it’s great to put it all in one book! Very excited to see the finished product! Great idea for a book – stories from local chefs would be very interesting. Thanks Vicky! My aim in including them is to have them share their perspectives on why food matters when you travel, and some tips on how they’ve connected with people. I also have a section on allergies – I’ve got celiac disease, and it’s definitely changed the way I travel and eat. For health reasons my mom has been placed on a gluten free diet dairy free diet so I’ve recently started experimenting with recipes that take into account those restrictions. I am sure it is difficult to travel with food restrictions especially if you cannot communicate your dietary needs to the food establishments, but I think it’s great you were even able to eat gluten free in Italy of all places! I know. I could NOT believe how celiac-friendly the country was. As there are many people with a gluten intolerance in the country, it does make sense but the laws they’ve passed (GF options in public places, etc) were a surprise! I imagine gluten free is easier in Asia with all the rice/rice noodle dishes? Or do they sneak gluten (thickening agents, etc) into their sauces? I have been actively seeking around the world travel now for about a year. After saving up more than enough money to do so as well as vigilantly researching the areas I would like to visit, I proposed a start date to my family as to when I would be leaving but have had a really hard time convincing them that I will be ok travelling on my own. Did you guys face any conflict with family when you decided to embark on world travel, and if so how did you deal with it? This is a question I get frequently from readers, and understandably so. I was working as a corporate lawyer in NY before I left to travel, so to many people I was insane for giving up a great job. But my family knew I wanted to do this – I had been talking about it for a long time – and they were supportive, though concerned about what would happen next financially. And yes, they were worried about safety, of course. They remain supportive but concerned, but have come and met me in Asia and seen me travel – they were surprised at how easy it is to meet people as a solo traveler. And they’ve been happy to see the friends I’ve met and re-met up with along the way. Thanks to technology, I’ve also kept in contact quite frequently with Skype and a Google Voice number, which goes a long way. My boyfriend and I are starting our trip in September so we mentally prepared our parents for the departure a few months ago. It definitely came as a shock. As an only child I think my parents are incredibly concerned, and worried about safety, and just not being able to see me and possibly communicate easily for weeks/months at a time. I think it definitely makes it easier for them that I’m traveling with my boyfriend but overall I think they realize that my 9-5 office job is never going to be enough for me and they want to see me pursue something that will make me happy. Book about food and travel? My two passions in life – can’t wait to hear more about it! replying here as our prior thread is maxed out. Yes, lots of options in Asia – Vietnam especially, and Thailand too. Though I have to be quite careful about the soy sauce (wheat flour is a primary ingredient), which is easily avoided if you ask. Sauces are not usually thickened with flour, but some of the vegetarian options are made with wheat gluten in lieu of meat and I found this out the hard way! (I was told it was mushroom – not so much). I forgot about the wheat flour in soy sauce — I’ve been buying tamari (gluten free soy sauce) in the US which is easy to find. So unfortunate you had to find out the hard way that the “mushrooms” were actually made with wheat gluten! Hope you didn’t get too sick because of it. Since you’re in Quebec at the moment, what kind of street food is available on the Canadian streets? Unfortunately there is very little here in the province of Quebec! Montreal does not allow for food trucks, which I hope will change some day soon. There is a great variety of international foods and restaurants, but sadly little in the way of street eats. We do have our poutine (cheese curds, fries and gravy, the provincial dish) which is perfect for street eats. Not yet, though. Not exactly street food but I also love the ketchup chips which I’ve only seen sold in Canada. Heh, we love our ketchup chips! Cheese curds you can find in Oregon or Wisconsin – where are you living? In Washington DC – unfortunately too far away from Oregon/Wisconsin : / Though I did find a poutine cafe/restaurant in Brooklyn, so there must be a way of getting them in this area! In DC…have you been to Pupatella in Arlington? Nope, but it sounds familiar — any good?? Awesome – thanks, will have to be on the look out! Thank you Mr. Hoffmann! Now, how to get our Montreal on board with street eats? They have this kind of thing in Brooklyn too — very artistic/hippy atmosphere and lots of delicious food vendors! Japadog? Never heard of such a thing! I wonder if they have that in Montreal… I’ll be heading up there for a weekend in July (right around their Jazz festival)! Jodi should lead a campaign to end the food truck ban. Awesome article – thanks! I will definitely be checking out La Banquise or La Belle Province next time I’m there! Jodi, speaking of your interest in food – this may sound like a stupid question – but for you what draws you to it in terms of travel? What would you recommend to travelers looking to eat their way around the world? Nothing stupid about the question 🙂 I think food is an excellent way to connect to people as you travel – it deepens your experiences by providing a new lens through which you can see the place you visit. It’s something we all need to do, and in much of the world the community aspects of eating – the quirky customs, the dishes, the way you eat and with what utensils – all those things contribute to a whole new way of seeing things. I didn’t start out this way – had you asked me a few years ago if I’d be writing about food I’d have said no – but as time went on it became apparent that this is what I cared about and loved learning about the most. The history of foods too – where they came from (e.g. the recent piece in Slate about how ketchup is from China http://www.slate.com/articles/life/food/2012/05/ketchup_s_chinese_origins_how_it_evolved_from_fish_sauce_to_today_s_tomato_condiment.single.html), how development has been affected by trade routes – all of that is fascinating when you learn and then see it firsthand. I completely agree with you about food being an outlet for learning about a culture/location and connecting to the locals. Very interesting article about how ketchup developed over the years. For those of you who are gluten-intolerant, how did you find out? Such a shame! Mangoes are my favorite fruit! I was diagnosed about a decade ago in France and before then I had never heard of celiac or gluten intolerance. I often had stomach troubles as a kid, but wouldn’t have suspected wheat as the culprit. I ended up moving to France and – of course! – eating lots of bread, and getting sicker and sicker. Finally I went to the doctor and they did an endoscopy and told me I was celiac, which I confirmed later on in NY. I actually stupidly ignored the diagnosis for a long time, but feel much healthier and energetic now that i’m strictly adhering to a GF diet! I have also heard that it’s possible to have a slight allergy to gluten instead of a flat out intolerance. A medical test would not show anything but I have a friend who is going to go gluten free for a month to see if he feels better (he has been having stomach problems). Definitely. A difference between intolerance and allergy, for sure. Many people find themselves uncomfortable but not as ill as if they were celiac; still why eat it if it makes you feel badly? And with the popularity of Paleo-style diets, lots of GF options = becoming more normal. I’m hearing more and more people talking about it now; there is even a gluten-free grocery in Ankara (I was surprised to hear about) and sections in many bigger stores in Turkish cities. I’m surprised because people are resistant to believing in broad food-allergies there. Interesting. I had some trouble in Istanbul (even when saying, per your Turkish instructions, that I had a wheat allergy) – people would look at me suspiciously, as though it wasn’t possible 😉 I kept asking for pilav instead of bulgur but it wasn’t as simple as elsewhere. Curious to see if the sentiment will change in the bigger cities in coming years. Interestingly, several people in Italy attribute the increased intolerance to gluten to higher incidences of gluten in GMO wheat – essentially that the way the wheat was modified meant that it had higher gluten levels than ‘normal’ wheat, so people who would be otherwise unaffected were finding themselves sick. I haven’t yet researched to see if that’s confirmed (I plan to! ), but it was an interesting explanation. My favorite in Alexandria is the all dairy products sandwiches in a place called Swissra (ie Switzerland) :D…And by dairy it is not just normal cheese and milk…it is also cooked cheese, fried cheese, fried cheese with anything (sausages, ground meat…etc) and also anything with eggs…damn I miss that place! my favorite sandwich in that switzerland shop is the molten cheddar with sausages! Hmmm the cheese sandwiches sound delicious! Hoping to make it to Egypt in the near future. Think I’ll pass on the liver though, like Anil I too was forced to eat it as a child and therefore now refuse to go near it! Hah! 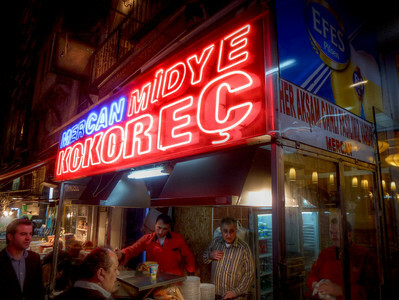 Well, what can I say actually one of my favorite Turkish street foods is kokoreç – grilled intestine sandwich. Also cheap! Grilled intestine sandwich? Sounds adventurous! I only spent 6 hours in Istanbul (layover on my way to Greece last year) but in that time I ate a delicious iskender kebab! Btw Jodi, how’s the connection holding up? Jodi, you had mentioned that one common question you get about street food is how to eat it safely. What are your best tips for doing so? (2) looking at when the locals eat – in many countries, the big meal is lunchtime, which is when street eats will have high turnover. Best to follow the local eating patterns. (3) hot food matters in many places – some sauces are safe at room temperature (if pickled or fermented) but many are best eaten hot. Making sure the food is cooked through goes a long way to stay safe while eating. India is one place where #1 is was so vivid in my experience. Some stands have nobody while the one right next to it has lines of people. Definitely a good indicator – as are the others! I have heard of a lot of people getting food sickness while traveling through India. A few months ago I hosted a couchsurfing couple – they had been traveling around the world and their policy was to only eat chicken (so no red meat) and they did not get food sickness anywhere (India included). I never got sick in India but came down with about a week of diarrhea each of the 3 times I’ve visited. (Sorry, gross I know but we’re all friends here 🙂 I think it’s a matter of the consistency of the food and getting used to the bacteria in the water, oils, etc. India though is the place where I’ve found I had to be most careful; though aside from that it’s one of my personal favorite places to eat. An entire week of diarrhea sounds pretty miserable! I’ve also heard that specifically in India you need to be very careful — guess we’ll see how it goes for Dave and I when we finally make it over there! 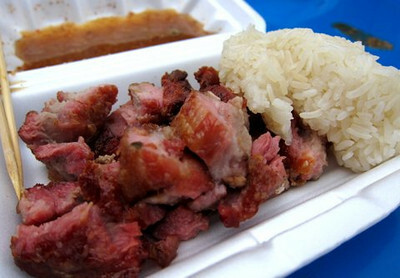 What are your top 3 street foods from around the world? Hm, a tough question! Hard to narrow down as I love quite a few. I think somtam (green papaya salad) from Thailand, pad pongali moo (yellow curry with pork, with celery root, shredded cooked egg and veg, on rice, also in Thailand) and ‘siu yuk’ (crispy, crackling, “five-layer meat” in hong kong, served with sharp yellow mustard. Wow all of those sound absolutely amazing and are making me so hungry! Good thing I only have an hour left of work and can then go home and cook up a storm! Your food site is great, by the way – going to bookmark for some quality reading! Have you ever gotten ill or picked up any parasites from food while traveling? Oh yes. The times I got the sickest were when I ignored the rules I listed above because I was so hungry. Lukewarm llama empanada in Northern Peru gave me some terrible food poisoning, with giardia and salmonella to boot. And the same in Myanmar, when I chose a vendor who was washing her dishes in pretty murky water. Lessons learned. 🙂 For what it’s worth, the last time I got sick was from a yoghurt (well before its expiration date) from a 7-11! Food poisoning along with giardia and salmonella as well just sounds like pure torture. In terms of long term budget travel that’s one thing I’m most concerned with — getting sick on the road, and specifically food based illnesses. It’s really not about budget, I’d say. 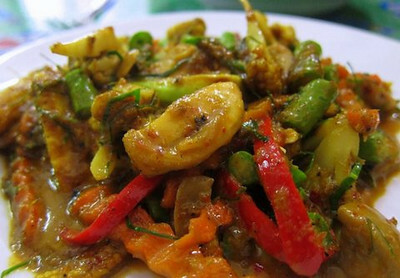 In fact, the times I’ve gotten sick are almost always from restaurants and not from street stalls. The street stalls are the “open kitchens”, transparent and allowing you to really see what goes on. As a result, they’re often safer than restaurants! As to the sicknesses themselves, a quick dose of metronidazole got rid of the giardia, and cipro is great to carry for other stuff (like salmonella). It wasn’t fun, of course! But they are treatable. Yes I too have heard that with the street stalls being so open to food can be fresher and better quality than the restaurants. I guess it’s not so much getting food sickness from budget travel but more so being sick on budget travel — dorm rooms in hostels with shared bathrooms instead of recovering in the comfort and luxury of a 5 star hotel. good advice on the medicine. Are there certain places that have known names and everyone in a certain city knows them and knows the guy working on them and so? It is so funny in Egypt there are some known names that would be very discouraging to go, yet they are the most popular ones! LOL @ “Mohammed Infection”!! Wait, those are the popular ones??!!! Guess I’m not going to eat at “Abdul Hygiene”? and number 49 (masala dosa) should be higher up! Where will you be eating your way through next and what are your upcoming travel plans? Until my backpacking trip starts in September in Japan I’ll be taking weekend trips up to Boston, NY, Montreal and down to Miami/Ft Lauderdale Florida, but I’m mostly excited for the food in Asia obviously! Apart from street “food”, street drinks anyone? There is a clear drink I tried in Argentina with some cab drivers but can’t recall the name (or much of that evening for that matter!) Moldova also had great homemade red wines. I never tried street alcoholic drinks, but it is very common here to see street “juice bars” or people selling tea…they are always pretty amazing! Sorry, my mind automatically defaulted to booze. North Iraq also has good (highly sweet) juices. I’d actually caution with juice bars more than the food itself – unless you know they’re using distilled water (or it’s in a place like Malaysia or Thailand where most ice is made from distilled water and/or the water itself is distilled), getting sick from smoothies or fruit shakes isn’t far from common. Not for the freshly squeezed stuff (no water added means no bad water!) but I always encourage travelers to think about the drinks not just the food when looking to plan for safe eating. 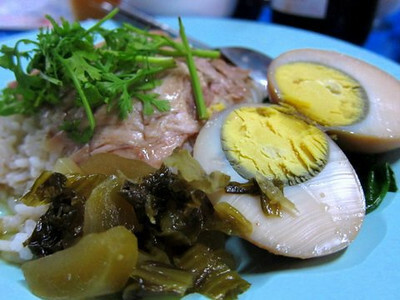 Heh, the last one is khao kha moo, braised bork on rice served with pickled veg and a hardboiled egg. Hmm the food looks familiar. Although ‘penang curry’ kinda gave it away, I still think these foods are not from the country that has a state named “Penang”. Singapore? All four of them are Singapore street food? Ekk wrong answer. I was gonna answer “Malaysia” though, since Penang is one of the states there. Definitely would not eat anything that’s still alive and wouldn’t eat any animal I think of as a pet! Jodi, what’s the strangest thing you’ve eaten? (Strange being relative of course.) Also, when you tell people you can’t have gluten, what are some of the reactions you’ve received? Hm, strangest tasting was the fermented mare’s milk and cheese in Mongolia – had a hard time wrapping my tastebuds around that! Bugs in Northern Thailand, though I skipped the fried spiders in Cambodia. How would you convince someone scared of trying new things to get into street food on their travels? I don’t think it’s possible without a leap of faith on their part in some respects. It’s scary because it’s unknown, but the conversations and stories about how people do tend to get sicker from restaurants than street eats, about the transparency of the kitchen and fresh ingredients and also availing themselves of info – tips, places to get great eats – all of that helps. It’s a bit of a crapshoot in the end – eating always is unless you make it yourself and know exactly where the ingredients came from. 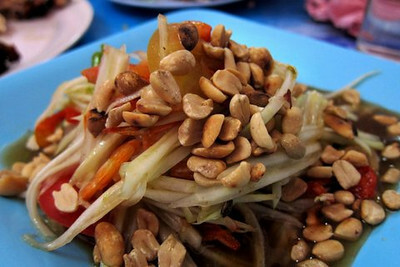 But I’ve found, and many others too, that street food is a great way of avoiding getting sick when you know how to choose your stalls, and also a terrific way to get to know and connect with local culture. Definitely agree that eating street food or local foods in general is a great way to connect with the local culture. Exactly why we started our app Eat The World (http://eattheworldapp.com)! I’m craving Indian or anything in the photos above 🙂 Thanks for the app that will help me find just the place wherever we are! What are your upcoming plans – both travel, blog, projects, and otherwise? Hi everyone, just wanted to let you know Jodi will have to drop out of the chat a bit early so if you have any quick last minute questions or comments now is the time! Just wanted to say I fully enjoyed my first blog chat and enjoyed getting to know you guys a little bit better! Hope our paths cross somewhere and we can share a meal together! Thank you very much Vicky for participating, hope we do cross paths (and over some good food!) one of these days. Ah guess I miss the train. Maybe next time. Anyway, perhaps I’ll check out your site since I’m already here. I wish this is done over a better medium (like irc or campfire, heck http://www.uberconference.com/) so I can go through what I missed out (especially when street food topic can educate me about “gluten free diet” and “diff between food intolerance & allergies”) . But this is great for future reference and archive I guess. So live chat on comment works for me, for now. Btw I’m Ajmal everyone. I read and follow Jodi’s blog for awhile now. One thing that amazes me every time I read her post is I think she takes good-pro-looking pictures! It makes the food looks so delicious as if it’s in front of me. Thanks Ajmal, and thank you for reading (and for the tweets). Happy to answer any other questions you have a bit later (I’m running out right now) so feel free to send them my way or post here. The photos were with a Canon s90 point & shoot camera until this fall, when I got an Olympus e-p3. Most of the food photos are taken with a 20mm lens. Oh you remember the tweets too. Don’t mention it; thank you for the awesome stories and inspiration of yours, including the food pictures that get me every time. Thanks for sharing the camera details too. I just realized how helpful that is until you write it down. yeah I totally understand and as long as it works for everyone, why not? Thanks for hosting this too! Thanks Anil – too kind! Hope our paths cross sometime soon, and appreciate the feature. Thanks again everyone for a wonderful chat – it’s been a lot of fun – food and great links here as well 🙂 As I mentioned above, this is the last live chat until the first week of September so until then, happy travels! Or, bon appetit!